Karbonn is still filling up the price segment under Rs. 16,000 with their devices and it seems that they have started winning the trust of their customers also. Their new device is in the league of Titanium S series named as Karbonn Titanium S4. The device has not revealed by Karbonn on their website but it seems that Flipkart got an early hold of it and thus we too got to know about it. 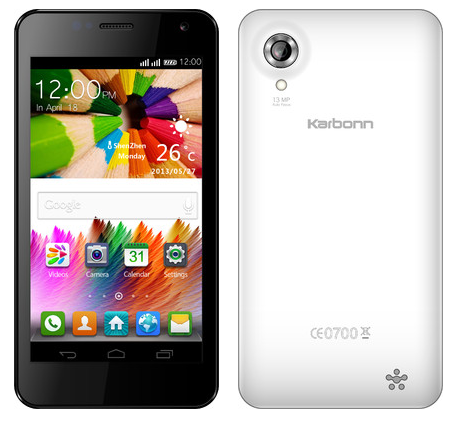 Karbonn Titanium S4 has been priced at Rs. 15,990 but it is not ‘in-stock’ mode, rather you will be notified once it gets in stock. It is a regular 1.2 GHz Quad Core Processor devices and we have already seen many of these earlier this year. The size of the display is 4.7 Inches with the resolution of 1280 x 720 (720p HD). The processor is obviously the Mediatek Quad Core MTK6589 clocked at 1.2 GHz. The primary camera of the Karbonn Titanium S4 is 13MP which also has the support a single LED flash. Though there is not information about the LED Flash on the specification sheet available on the Flipkart but we are perceiving that from images of that device available on Flipkart. The secondary camera is as good as a VGA camera. You will be reading about its specifications described in detail and its comparison with Titanium X within few hours. The operating system on which this phone operates is Android 4.2 Jelly bean. The memory allocated to RAM is 1GB and the inbuilt memory is 4GB which can be further extended. It seems to me that it is the mini Titanium X because you can see that along with its price every other specification has also been scaled down. We will let you know as this device gets ‘in-stock’.